It begins with murder and ends in damnation: Mozart’s rather bleak follow up to The Marriage of Figaro, and is, if anything, even more politically incendiary in its depiction of the licentiousness of the gentry than its more controversial predecessor. Don Giovanni’s arrogant defilement of as many and any women as he can lay his hands on may be comparatively democratic (in his eyes, he’s doing them a favour, after all), but his particular taste for ‘peasant girls’ to pass the hours between major conquests and his cavalier treatment of his own manservant Leporello includes a climatic threat to run him through with his sword if the man does not complete his invitation to a statue. I’ve seen several productions of Don Giovanni over the past number of years, including a surprisingly chilling full-length all-puppet version in a Prague puppet theatre (the Commendatore’s statue was played by a full-size human, which was terrifyingly effective). The notes for Opera Ireland’s presentation of the Opera De Monte Carlo production clearly suggest a lighter tone is in the offing, and certainly though the libretto contains many humourous situations and lines of dialogue, I’ve always found these as much an expression of desperation and terror as they are light relief for the audience (who grab them with gusto). Thankfully, Jean-Louis Grinda actually does not attempt to lighten the mood. 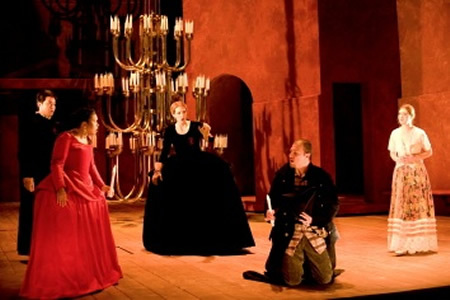 Though he plays the humourous asides and wrings laughter from them, an early sombre, extended pantomime scene showing two servants mopping up the pool of blood left after the Commendatore (American Bass Brian Jauhiainen) is murdered is effective enough in underlying the darkness at the core of this drama. Similarly, the use of faceless female figures seduced one by one (all except the one who is clearly pregnant) during the overture by a wandering Don Giovanni (Austrian Baritone Paul Armin Edelmann) returns to haunting effect in the end as the libertine feels his soul being torn to pieces before being dragged down to hell. It’s not a happy tale. In between these scenes is a spot-on mounting of the Opera featuring a good and fresh cast of young voices, all performing with a commendable sincerity. In contrast to last year’s self-consciously silly (maybe overly so) The Marriage of Figaro, there’s no excess of irony here to overwhelm a solid classical staging with just enough modernity to connect with the audience. Designer Rudy Sabounghi’s marvelous set evokes the desolate dreamscape of Gregorio de Chirico. A beautiful clay-hued forced-perspective set of Spanish buildings slide gracefully stage left and right to confine or expand the space, both literally and figuratively, as characters sometimes find the world really has changed when they weren’t looking. Equally superb is Laurent Castaingt’s lighting, again capable of changing the sense of location and tone with both subtle and dramatic shifts in luminescence and colour temperature. The confrontation with the Commendatore’s statue is played just the right side of silhouette to provide detail and avoid abstraction. Paul Edelmann makes a good Don Giovanni. His voice is brash and clear, and he acts the part with enough swagger to be believable and not stoop into self-parody. His brother Peter enjoys some nice moments with him in the role of Leporello, and the voices play well together. Irish Sporano Cara O’Sullivan gives a fine performance as Donna Anna, with moving renderings of Anna’s arias and, again in terms of acting, presenting a characterisation with stops short of going into overstatement. Japanese Sporano Mari Moriya is a firmly established audience favourite in Dublin now, and her sweet, clear voice is used to good effect in characterising Zerlina, the peasant girl targeted by Don Giovanni at her own wedding. Italian Tenor Paolo Fanale gives a very appealing performance as Don Ottavio, with both face and voice registering an honesty that works perfectly for the character. There is a tremendous simplicity, sincerity, and clarity to this production, which is nicely paced, well designed, crisply directed, and well performed. It amounts to a clean and clear rendering of the Opera, and though it avoids an overall oppressiveness does not seek to evade the sense of moral turpitude and Divine vengeance that weighs heavily over the action. We may kind of like Don Giovanni for his energy and conviction to pursue his sins to his grave, but we shouldn’t actually want to go with him, after all.